It was the perfect day to be on the Atlantic shore. The sky was Cerulean Blue with the high scattered clouds only accenting the beauty of the day. The wind, out of the south at a steady 15 to 20 knots completed the triage of perfect August weather at the Maryland shore, when at last the temperature, the humidity and the cooling breeze blended to become as close to an ideal environment that a human being could ever experience. I was there on the sand, occupying a trackless expanse of remote beach, totally alone with the beautiful girl that was spinning my head around this bucolic summer of 1967 when my life seemed to be constructed of wondrous and limitless possibilities. But there was a flaw in this portrait of a romantic Shangri-La, because I wasn't strolling across the sand or watching the breakers, hand in hand with my girlfriend. No I wasn't. 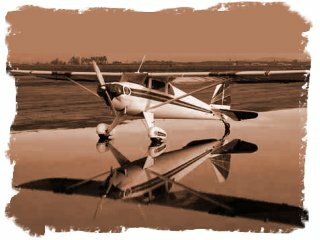 I was instead, at the controls of my Luscombe 8A, just beyond the reach of the surf, throttle firewalled, aircraft unmoving in the sand and the tide was coming in. I was scared. How, you might reasonably ask, could a rational pilot get himself in such a stupid and desperate condition? The seeds for the potential disaster had been sown a few years before, when as a fledgling pilot I had read, reread and then totally absorbed and committed to memory, a book by Wolfgang Langewiesche called 'I'll Take The High Road'. Without any question this book affected my life and consequently my whole flying career. It was most definitely the reason I was here, stuck in the sand on an Atlantic Beach with my airplane about to be swallowed by the sea. 'High Road' was a wonderful first person account of a young man learning to fly during the depression, and it was filled with such marvelous and skillfully described adventures that even now I can still remember them. One story that I had loved was the author's graphic recounting of a beach landing in a Piper Cub near Kitty Hawk. In the tale he was headed to Florida, following the coastline at low altitude, and he spotted a particular stretch of beach that looked so inviting that he decided he had to land and walk on it. That tale, still rattling around in my brain, had spurred this particular bit of insanity on my part and led directly to my present sad situation. The landing part of the story was what I was remembering when my brain locked up and decided that I too, needed to explore the inviting beach below and It wasn't until I discovered that the end of the landing roll was the end of any rolling at all, that I remembered he had also gotten stuck. Slowly, as the little Continental roared impotently and the stationary Luscombe trembled, the balance of the tale started coming back to me. He did get stuck, but he also was able to fly it out. I wracked my brain for the rest of the story, and then I remembered. He raised the tail and used alternate rudder to cause one wheel at a time to creep forward, walking it, faster and faster until the lift of the wings started to take the weight off the wheels and allow them to roll in a straight line. It worked for me exactly as it did for the author in the book. The first yaw produced only a few inches of travel, but opposite rudder gave exponential increases in distance until as last it was rolling straight and I could feel the wings start to lift. Faster and faster the little airplane accelerated and suddenly we were flying, free of the beach and safe from the hungry waves. I had learned a lesson about beach landings sure enough, but I seemed to continue to have a penchant for landing places where airplanes weren't usually found, forced landings aside. Odd spots that struck me as needing the touch of an airplane drew me with a force like magnetism and I spent years landing in places that were not airports, just because I could. For example, early one Sunday morning when most normal people were still sleeping, I was on one of my Dawn Patrols in the Luscombe, the air cool and smooth and the Luscombe and I alone in the sky. Suddenly and without warning there it was, beckoning to me like the sirens singing to Odysseus, an inviting stretch of the newly built Interstate-79. This section of the road was gracefully draped on a gentle slope then arced across the top of the hill before starting an easy descent into the next valley. It gleamed enticingly in the morning sun, clean and new, not yet opened to traffic, and as I gazed down at it in the slanting light it begged, begged I tell you, for the gentle kiss of an airplane tire. I had no choice. Recently while at a Walmart store here in West Virginia, a middle aged looking fellow came up to me and asked if I was Steve Weaver. I admitted I was and wondered where this was leading. He told me that thirty or more years ago when he was helping his family bale hay on a farm in the Central part of the state, I had landed the Cub in their field where they were working. I remembered the incident and immediately recalled why I had done it. It was a beautiful, warm late-summer day and as I flew over I saw the children that were helping with the harvest, running and waving at the airplane overhead. Suddenly my eight year old self was running beside them, thrilled beyond speaking with the thought that an airplane was about to drop out of the sky beside me. Such an event was my greatest wish during that time of my life, but it never happened for me. But now I could make it happen for these kids. And so I did.